PRESQUE ISLE, Maine — A southern Maine couple who soon will retire to Aroostook County will be “living the good life” in the area thanks to students and faculty at Northern Maine Community College. Terrence and Carolyn Hanlon, who now live in Windham, are expected to move into the newest Sinawik House in Chapman this fall. The 1,400-square-foot modular ranch-style home was built by students and instructors in NMCC’s trade and technical occupations programs. The home is the 34th one constructed as a result of a partnership between the college and the Presque Isle Kiwanis Club. Sinawik, which is Kiwanis spelled backward, is a nonprofit organization founded by the Presque Isle club. Each year, the organization partners with the college to build a home that is contracted by and sold to a family. The Hanlons’ new home has been under construction for the past six months, and they helped hold their first official barbecue inside the residential construction lab at NMCC Tuesday afternoon. More than 60 people turned out to congratulate the couple and see the new house, which still sits in two pieces in the lab. It features two bedrooms, 2½ baths, a home office, a kitchen-dining area and living room. A foundation for the home will be poured in the coming weeks at the corner of Grendell and Littlefield roads in Chapman. A breezeway and garage will be added to the home on-site. Terrence Hanlon said Tuesday afternoon that he and his wife, who is originally from Washburn, were looking around for a dwelling to retire to in Aroostook County when a friend put him in touch with Guy Jackson, who is NMCC’s residential construction instructor. Jackson has built 30 Sinawik houses over the course of his career at the college. After 30 years, Jackson has the construction of Sinawik houses down to a science.The project begins anew each year at the beginning of the fall semester. Sinawik finds a buyer, who pays a lower-than-usual price because the NMCC students do all of the labor. The buyer is responsible for purchasing the building materials, property lot and foundation, and completing water, sewer and some interior work. Preliminary floor plans are developed by the college’s computer-aided drafting program and approved by the customer. Framing work on the walls, doors, windows and roof is completed by the first-year students in Jackson’s program. They then step away from the project and let students in the plumbing and heating program, the electrical construction and maintenance program, and the welding and metal fabrication program, do the “rough-in” work. Wiring and ductwork are completed, and the home is inspected. After that, senior residential construction students come in and do the finish work, which is now being completed. More than four dozen NMCC students and instructors in five programs have helped build the home. Tuesday’s ceremony also served to recognize Jackson for the impact he has had on the Sinawik program. Jason Parent, NMCC director of development and college relations, praised Jackson for his work over the years. He said Jackson has served as a friend and mentor to countless numbers of students, and pointed out that there are 30 homes across The County that Jackson has helped build. Jackson was presented with a framed copy of the floor plans for the 34th Sinawik home. Jackson thanked students, friends and colleagues for their praise, and told the crowd that he has “put a little piece” of himself in every home he has built. The partnership between NMCC and Kiwanis was forged in 1976 to provide students in several trade programs with a “real-life” practical experience and as a way for Kiwanis to raise scholarship funds to invest in the local community. Terrence Hanlon said he has his wife “can’t wait” to move into their new home. “We are ready to start living the good life,” he said Tuesday. 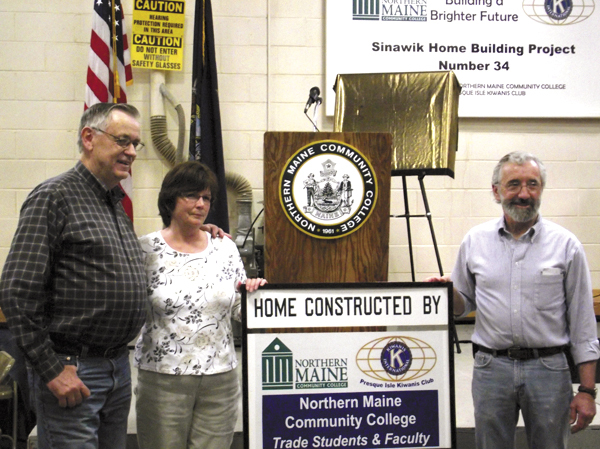 Terrence and Carolyn Hanlon, who currently live in Windham, stand with Guy Jackson, right, the residential construction instructor at Northern Maine Community College, during a barbecue to herald the 34th Sinawik House at Northern Maine Community College on Tuesday. The Hanlons are expected to move into the newest Sinawik House in Chapman this fall. The 1,400 square-foot-modular ranch style home was built by students and instructors in NMCC's trade and technical occupations programs. The home is the 34th home constructed as a result of a partnership between the college and the Presque Isle Kiwanis Club.